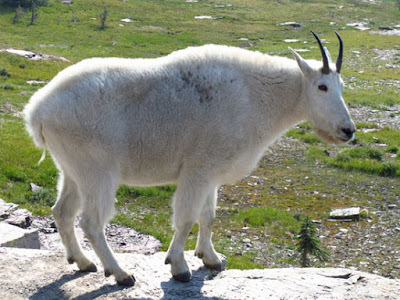 Established as a national park in 1910, Glacier is well-known for opportunities to spot wildlife. But there are additional reasons why you should plan a visit—sooner rather than later. 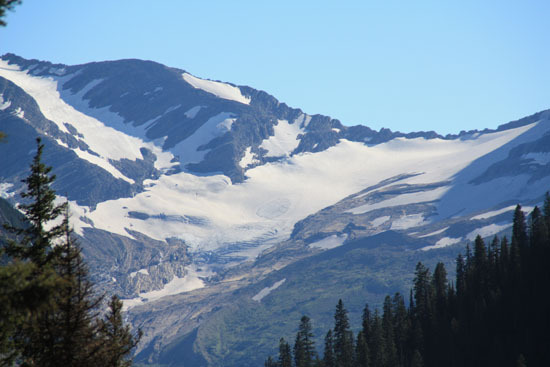 Only 26 of the 150 glaciers that existed in the park in the 1850s are still there today. For most of those, visitors just see remnants of ice high in the mountains. Scientists estimate that there won’t be any more active glaciers in the park by 2030. Even without wildlife and glaciers, abundant mountains and lakes in this northern park provide some of the most spectacular scenery in the United States. Roads in the park take you near many of the 131 named lakes (more than 630 lakes are unnamed). The park also contains 175 mountains and more than 740 miles of trails for spectacular views. 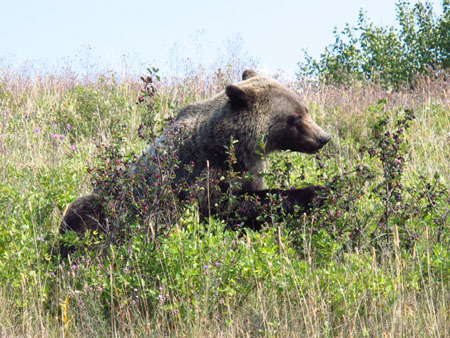 Bears fatten up on berries in late August. Whether you see the scenery from hiking trails, boat rides, private car, tour bus, or while sipping a glass of wine at one of the vintage lodges, the vistas will become etched into your heart and mind. Every turn in the road, every direction you look, there’s another “wow” moment to remember forever. Glaciers are still visible but many are disappearing. As summer changes to autumn, it’s prime time to enjoy a beautiful drive or take a breathtaking hike on one of the trails. Explore the changing landscapes and get your third night free when you stay at any of the park’s properties now. Book online or call 406-892-2525 to reserve. 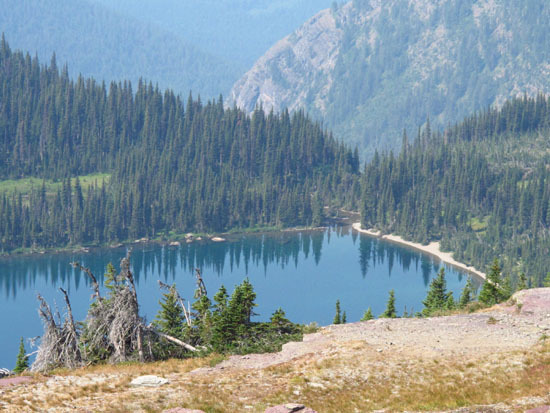 Hidden Lake is a beautiful destination, and the hike is easy. 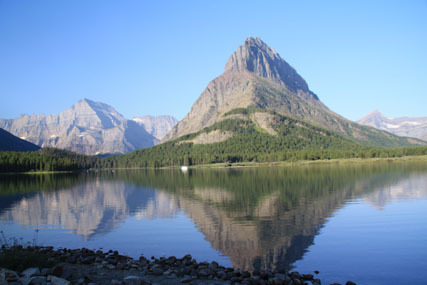 Glacier National Park encompasses one million acres. Knowing we couldn’t cover it all, we chose to stay at two lodges in opposite ends of the park. Our first destination was at the park’s largest lake, McDonald Lake. We entered Glacier National Park at the St. Mary entrance, got our bearings at the Visitor Center there, and headed south to McDonald Valley in the forested, less mountainous part of the park. Within half an hour we spotted the first black bear ambling along the roadside gathering berries. Later, heading to ManyGlacier Lodge on the northeast border, we drove on the narrow, winding Going-to-the Sun Road, aptly named a National Historic Civil Engineering Landmark in 1985. If you’re not comfortable behind the wheel, take a guided tour—but don’t miss this experience. Mountain goats were plentiful, but this one was especially close. The 12-mile road to Many Glacier Hotel is reputed to be one of the best sections of the park to view wildlife. With 68 animal species and 227 bird species in the park, you’re almost guaranteed to spot a large variety of wildlife. 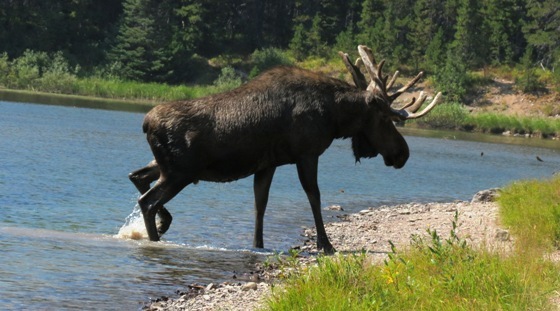 Along with watching as a mama bear and two cubs amble along the road by our lodge, we stood spellbound as a bull moose crossed Fisherman’s Cap Lake in nearby Swiftcurrent--mere yards from spectators on shore.